If you don't have your act together, you'll find out about it very quickly. 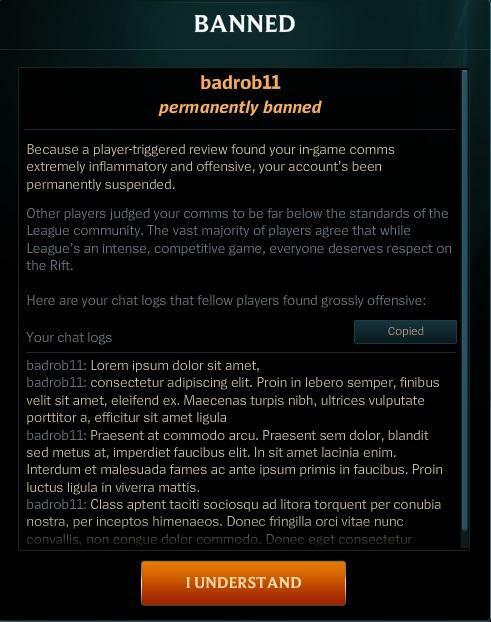 A few months ago, League of Legends launched the first version of their instant feedback system. This would hand out either 2 week or permanent bans for verbal toxicity in game, depending on the severity of the offense. Now, the scope of the system has been widened. Under the old system, the only possible punishments were either 2 week or permanent bans. Now, less harsh penalties like chat and ranked restrictions can be handed out instead for less egregious offenses. In addition, intentional feeding can now be detected, and will be met with a 2 week ban. If the behavior continues, it will be escalated into a permanent ban. Finally, players who avoid acting in these unacceptable manners will be rewarded with an exclusive summoner icon, which will likely be given out during the 5.19 patch.